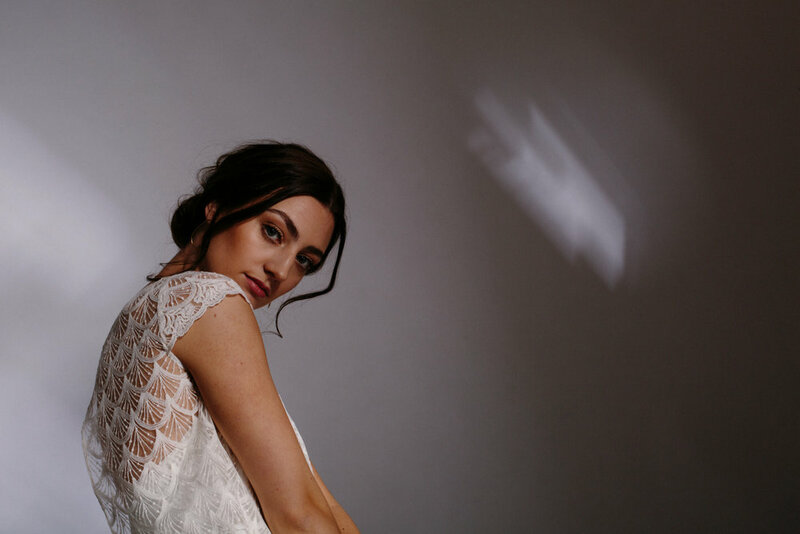 Clean lines, modern silhouettes and minimal jewellery for our latest editorial bridal fashion shoot with LAURA J CURRAN PHOTOGRAPHY. The idea for this shoot has been brewing for a while and when the new season OTADUY dresses arrived they had that minimal modern style that I was looking for. Inspired by the high fashion studio editorials we focused on the simplicity of the gowns and the light to create this edgy bridal look. I kept the accessories minimal with our beaut Lines and Current pieces (available to buy at the studio) as I wanted to show that your bridal jewellery can still be on point. If layered necklaces is your thing then just go for it with your wedding dress too. As always Laura and Pete nailed it with the photography and creating the light effects. They are the BEST CRAIC and will make you feel super relaxed on your day, so book them for some serious LOLZ. And KUDOS to Isobel for throwing some serious vogue shoulders. You can try on all theses goes in store now - get in touch to book your private 1 hour appointment.